There are few products in the makeup world guaranteed to look great on everyone. Basically, those few items are baby miracles come to us from the makeup gods. Score one for us because according to the New York Times' T mag gold makeup is perfect for everyone. While you may be hesitant to break out the foiled shadows or golden cheek highlight, the truth is now you know the stunning tone will look great on you. Plus, you'll be totally on trend. Gold makeup has become increasingly popular on the runways and in every day, as T Mag brilliantly pointed out in its piece. With the festive holidays coming up, what do you have to lose from attempting the trend? Golden hued makeup is definitely something I've always been shy about. With my excessively pale skin and aversion to self tanners, I worried that golden tones were more suited to darker hued ladies. According to T Mag, though, that's just not the case. The piece shouted out designers — like Elie Saab and Delpozo — who'd had golden tones in their runway shows for all their models, but for me, the most relatable example was that of Pat McGrath. The talented makeup artist, known for her incredible editorial and runway work, recently made the move into crafting her own products for the everyday woman. Where did she decide to start? With a brilliant gold pigment wearable in multiple ways. Before the launch of her pigment, McGrath took to the streets of Paris — during fashion week, of course — to apply the miracle product to famous faces and fortunate everyday passersby. The resulting looks were proof alone that the New York Times style mag is correct in their assertion that gold looks good on everyone. 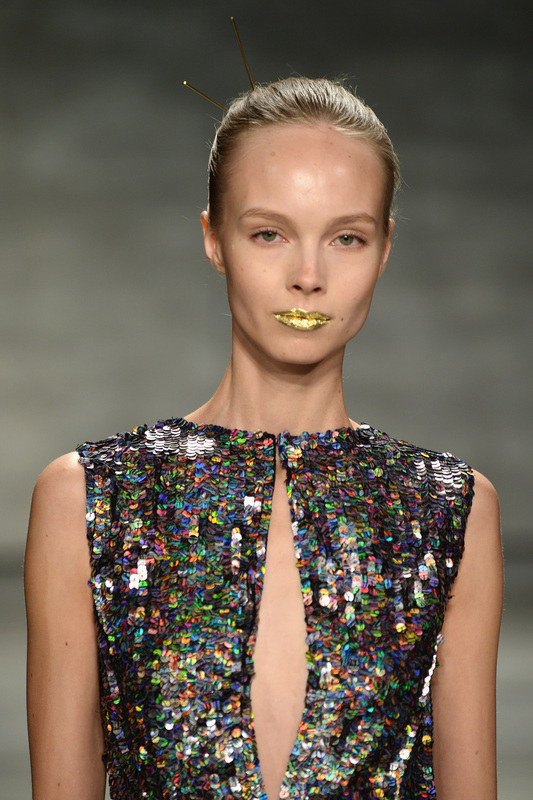 So if you're thinking of going out on a limb and trying some golden flair, how should you rock the trend? Jazz up your cheeks a little with this golden bronze shimmer. Opt for a wash of gold over your lids, or amp up the volume and layer away! Want just a hint of gold? Pop some eyeliner in a thin streak across your lip, or go a bit more wild and place it in your water line. This golden peach gloss will give you a gorgeous shimmer without making you look like a cast member of Goldfinger.